For as long as I can remember my mum has turned into a little Delia Smith during December. Weekends were filled with mince pie making, cake baking and generally turned into a festive food frenzy. My favourite of all her bakes had to be her sausage rolls. I’m not sure why I love them so much, they’re just the perfect little food to whip out when people pop over or for an evening snack after that huge Christmas dinner. They can be frozen in advance of Christmas too which is handy if you’re anything like me and turn into a headless chicken during the run up to the Big Day. 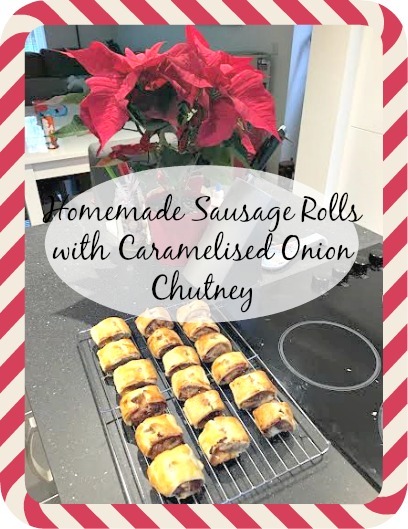 Since I’ve lived away from my family I’ve tried several methods to make the sausage rolls following my mums basic recipe and my favourite combination to date has to be homemade sausage rolls with caramelised onion chutney. They taste like Christmas in one (maybe two) small bites. I whipped these up, from frozen, for a party last year and by the time I got to the buffet they’d all gone! So, in the spirit of Christmas I thought I’d share my recipe with you – it’s super simple so it’s easy for the kids to help out too. My daughter loves to paint the sausage rolls in the beaten egg mixture. A pinch of chilli flakes if you like a kick! Lightly flour the surface and roll out the pastry to create a large rectangle about 3-4mm thick. Slice across the length of the pastry to create two even rectangles. Spoon a small amount of caramelised onion chutney down the centre length of each rectangle. Place the sausage meat mixture on top of the chutney mixture. Ensure you do not overfill as you need to roll the pastry over the sausage meat enough to seal it. Take the beaten egg and brush it along one side of the pastry. Roll the pastry over to create a sausage roll shape. Cut the sausage rolls into inch wide pieces or the size you desire. Snip a small hole in the top of each one with scissors, place on a lined baking tray and brush with egg. Bake in the oven at 200 degrees centigrade for 20-25mins or until crisp and golden. Cool on a wire rack and try not to eat them! Previous Post High risk pregnancy?